One of the most revealing impressions I received from attending the opening- besides the energy of so many kindred spirits- was seeing the pieces up close and personal. 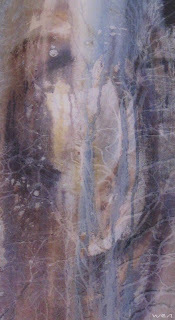 Pieces in a book, however beautifully photographed lose texture, and in many cases color. My work lost many of the delicate colors in the book that you would see in person. Elin Noble's work lost the delicate texture. If you can, this is a show to see in person! 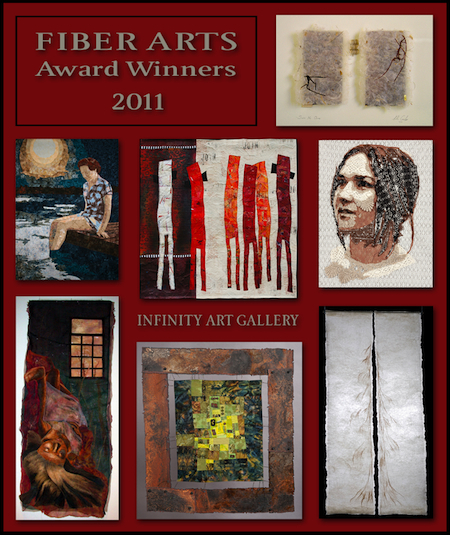 So many folks worked hard to present this fine Fiber Exhibit. The catalog is excellent. But do try to see it when it travels to your area! Fiber Revolution Members- Benedicte Caneill, Cindy Friedman, Judith Plotner, Wen, Kate Themel, Kevan Rupp Lunny The Fiber Rev's are smiling in front of Alice Beasley's piece. QN rocks with high energy and high fiber exhibit! Kate received the Young Emerging Artist's Award! It was beyond all connecting names with faces and work and meeting folks whose work I've admired for years. And meeting lots of folks for the very first time. Each artist spoke a few minutes about her work. This was a very insightful and fulfilling listening experience. You got to see the work, hear the artist's inspirations and feel her energy. Sometimes to the point of tears! Cindy speaking about her work. More to come on that!! My first time accepted and just returning. 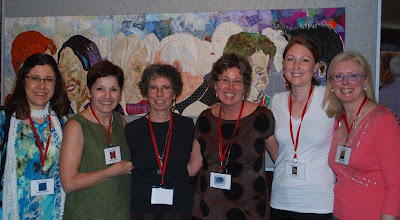 Kathleen Dawson, Quilt National Director, said I missed the Persistance Award by one year! If you can, by all means go. QN lives up to it's reputation of expanding the art quilt to beyond!! Busting off to Quilt National! Off to Quilt National! I’m so excited! I can’t wait to go and see the show. 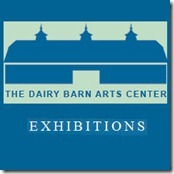 I’m looking forward to seeing my work exhibited at the Dairy Barn Art Center. It took over 17 years of trying to get in! And my piece, Leaping Point, was purchased already by Marvin Fletcher, the former directors husband! Touch the Earth will be included. One of the TONS of exhibits at the upcoming Surface Design Conference. It was never about safety. at long last, became one. 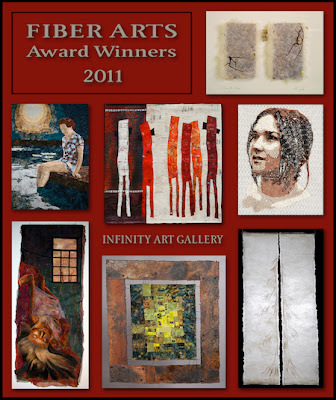 Professional Art Quilters Alliance-South juries 3 pieces in! ARTQUILTSmovement. May 20 – July 24, Durham, North Carolina. Only 32 out of 100 quilts were chosen for the movement theme! PAQA-South Spring Conference hosts Alyson Stanfield, author of, I’d rather be in the studio! Alyson will present “Shameless Self-Promotion: A No-Excuses Art Marketing Workshop”. Friday, May 20th and Saturday, May 21st, 2011. 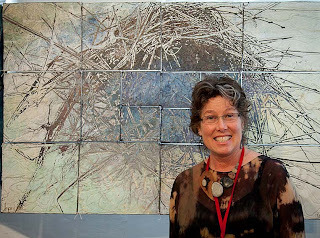 Jurors Judith Content and Carolyn Ducey have chosen the artists for "SAQA Showcase" to be exhibited at the International Quilt Study Center from July through October 2012. I am so pleased and honored! 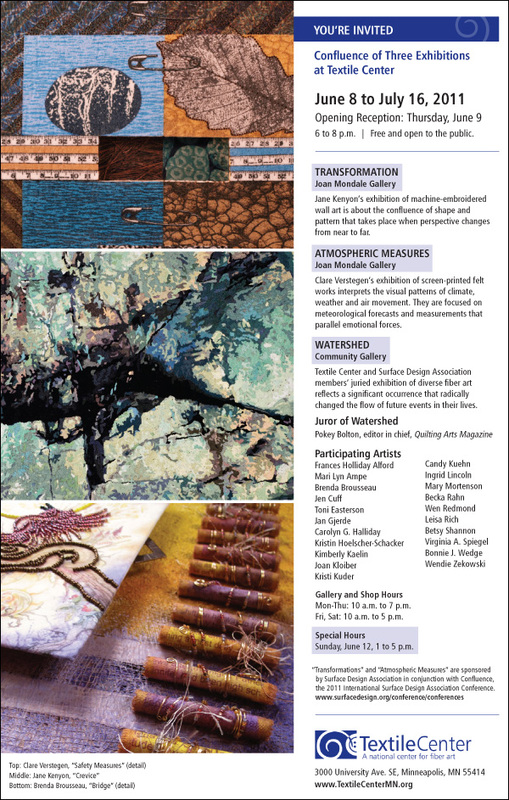 My Piece Touch the Earth has been accepted into Watershed, a surface design fiber art exhibition by Textile Center Members. Textile Center is located in Minneapolis, MN. Statement - I interpreted the Watershed Moment based in the way I construct my art. 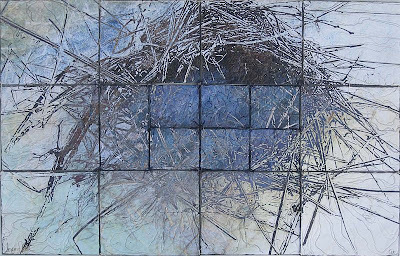 I am a process person and enjoy not only doing the work; but attaining that flow of unconscious response to mark making. I love learning new ways of expressing. 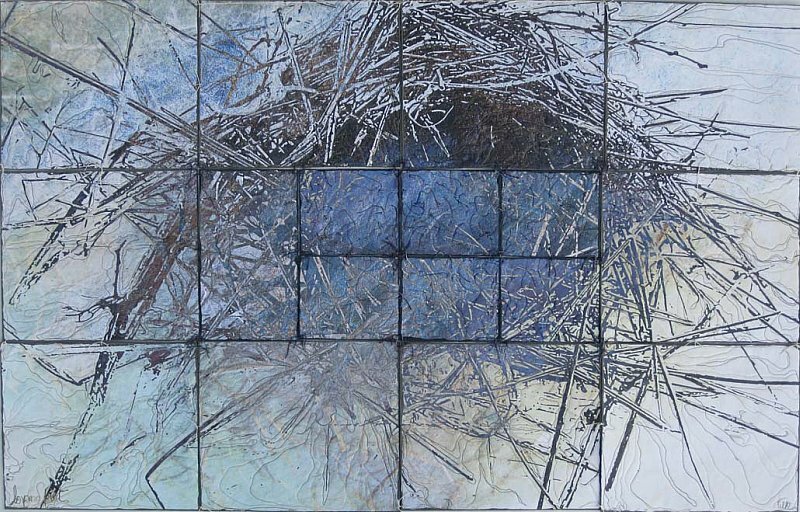 Touch the Earth is an example of my new collage method, offered as a workshop, called Serendipitous Collage! Recently published in Cloth Paper Scissors Magazine this past winter, I combine paper, fabric and all sorts of items to create a unique one of a kind collages. It is a green way of working! Revelation! OPEN STUDIOS !!! Visit Wen's Studio #336! 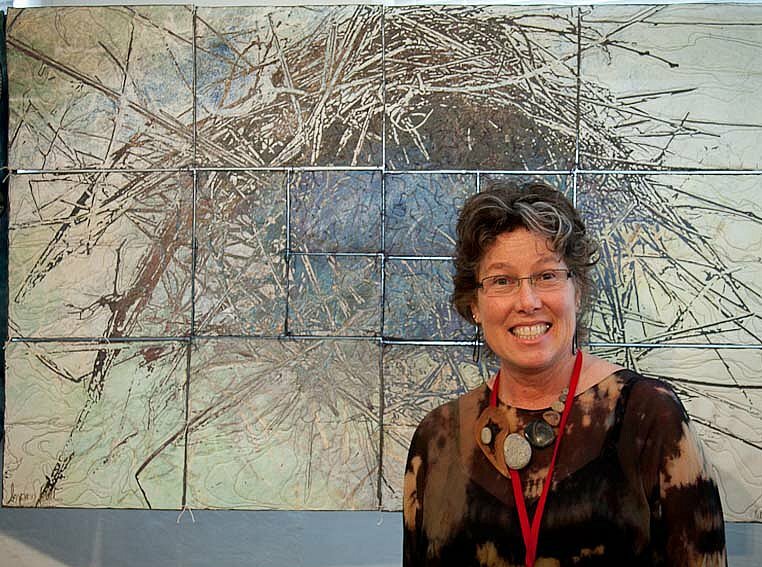 Twice a year, the Saturday before Mothers' Day in May and the Saturday and Sunday before Thanksgiving, the artists of the Salmon Falls Mills open their studios to the public. The Upper Mill is not handicap accessible. No dogs please. Surface Design Association Conference CONFLUENCE is coming closer! It features pre and post workshops, a conference in the middle and gorgeous fiber exhibits that set your blood racing. Oh! and of course there are tons of venders. This is really fiber heaven. Sadly, I have only gone to 2 others. But this year I will attend and TEACH!! I am presenting a workshop MIX IT UP- Media Mix Collage! We will learn about different substrates, ways to create unique collage materials- in both fabric and paper. We will be introduced to a variety of mediums and create tons of samples. Well, not tons, but lots! I include of one of my specialties, a Serendipity Collage technique that is sure to please. It's always a surprise! Every night several workshop presenters will show slides. Just in case you're not inspired or stimulated enough. Or you can just chill your smoking brain. Time is running out!! Hope to see ya's there! tired, she closes her eyes.